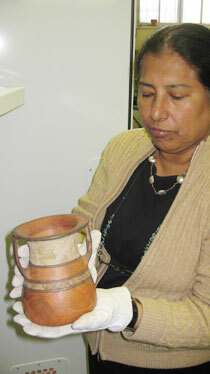 Yale researcher Lucy Salazar examines Incan artifacts collected by Hawaii's Hiram Bingham III from Machu Picchu, Peru. NEW HAVEN, Conn. » Unrivaled as a New World archaeological collection, thousands of pieces from Machu Picchu, the famous "lost city" of the Incas, lie in shallow boxes and metal trays on work tables and in cabinets in the basement of a nondescript brick building at Yale University. Schools: Punahou School, 1883-1892, Phillips Academy, Andover, Mass., 1893-94. Claim to fame: As a Yale University lecturer in South American history, he discovered the Inca city of Machu Picchu in Peru in 1911. Government service: Lieutenant governor of Connecticut, 1922-24; governor of Connecticut for one month in 1924; U.S. senator, Republican from Connecticut, 1924-33. The Peruvian artifacts have resided at Yale since they were painstakingly assembled nearly a century ago by the "Indiana Jones" of his day, Hawaii-born explorer Hiram Bingham III. Bingham, often cited as the inspiration for the Hollywood character whose latest movie opened Thursday, is little known outside of scholarly circles, but he has had a profound influence on the understanding of South America's dominant pre-Columbian culture. "I'm sure he is here, watching over my shoulder," says Lucy Salazar, a Peruvian-born archaeologist who works closely with the collection with her husband and colleague, Richard Burger. In fact, she says, Bingham's fastidious, even "fussy" personality is reflected in the breadth and depth of the artifacts, which range from stunning ceramic gourds to the tiny jawbones of rats, each with an identifying catalog number. "For an expedition in 1912, he was a pioneer," she says. But if Peru -- and Yale -- have their say, the bones, pots, plates and shards won't stay here much longer. Last year, after a decades-long dispute, negotiators from the university and the Peruvian government agreed that most of the artifacts would be returned to the ancient Inca capital of Cuzco. Under a memorandum of understanding signed in September, Yale recognizes Peru's title to the artifacts but would keep some for its own research and display purposes. And it wants the pieces that go back to Peru to be kept in an appropriate, academic setting. Those steps, and a joint traveling exhibit of some of the major artifacts, were to have been accomplished by the centennial of Bingham's discovery in 2011. But ongoing arguments now threaten that timetable, says Barbara Shailor, deputy provost for the arts at Yale. Shailor would not discuss the details of the standoff, but noted that there has been some recent disagreement about what constitutes a piece. She asks, "If a jug is in 300 pieces, is that one piece or 300?" Yale says one. Peru says 300. "Yale is definitely eager to continue the negotiations," she said in an interview Wednesday. "I think it would be a shame for us to miss the centennial." It was in July 1911 that Bingham stumbled across Machu Picchu, recognized today as a country palace for the Incan nobility, kind of like the Camp David U.S. presidential retreat in Maryland, only in a rugged, jungle setting high in the Andes mountains. In his 1948 memoir, "Lost City of the Incas," Bingham drew on his childhood in Hawaii to describe the terrain: "It has the majestic grandeur of the Canadian Rockies, as well as the startling beauty of the Nuuanu Pali near Honolulu, and the enchanting vistas of the Koolau Ditch Trail on Maui, in my native land." Bingham was the grandson and namesake of one of the first missionaries to arrive in Hawaii in 1820. His father, Hiram Jr., also was a missionary, most noted for translating the Bible into Gilbertese. Hiram III attended Oahu College, now known as Punahou School, then transferred to Phillips Academy in Andover, Mass., where he graduated in 1894. Growing up in a strict missionary family, Bingham by all accounts was ready for adventure by the time he finished college. "He was cramped by a constant need for academic success and by the fierce religious fundamentalism of his parents, from which Bingham tried to escape," says Hugh Thomson, an author and documentary filmmaker, in the introduction to the 2002 reprint of Bingham's book. "Peru provided a freedom he never had when young." That observation is supported by his son, Alfred M. Bingham, in a 1989 biography. "Hiram's father would occasionally take him for walks and even gave him his first taste of mountain climbing, hiking up to the top of Punchbowl or Diamond Head," he writes. "But such father-son camaraderie was rare. More memorable was the short stick his father kept within easy reach in an effort to comply with the Biblical warning that to 'spare the rod' was to 'spoil the child.'" No surprise then that at age 12 Hiram III ditched school, withdrew $250 from his college fund and bought a ship ticket and new clothes, says the book. His plan, to sell newspapers Horatio Alger-style in New York, unraveled when the ship didn't sail that day. As a yale lecturer, Bingham focused his attention on South America because it was largely unstudied territory. His first trip to Chile and Peru, in 1908, was as a delegate to a scientific congress in Santiago. When he returned to Peru in 1911 with some Yale classmates, his goal was to be the first to climb Mount Coropuna, then mistakenly believed to be the highest Andean peak. A native villager alerted him to the overgrown ruins that ultimately became known as Machu Picchu. On a follow-up trip in 1912 sponsored by Yale and the National Geographic Society, Bingham found relatively few objects in the city itself. More fruitful were about 100 nearby burial caves containing bones and objects that likely belonged to the deceased. These included necklaces, bronze knives, bronze and silver shawl pins, and a wealth of ceramics, including dishes, jars, cooking pots called ollas and bottles for corn beer, the drink of choice among the Incan elite. The bones of various animals, including llama, agouti and a Peruvian hare, represent food for the afterlife. Some of the prettier items occupy display cases off the foyer of Yale's neo-Gothic Peabody Museum. But nearly all of the 4,000 others (by Yale's count) are across the street, around a towering ginkgo tree and down the side stairs at 175 Whitney Ave., where Salazar and purple-gloved graduate students pursue their studies of a civilization that peaked around 1470. Salazar said there is no doubt the collection has been safer at Yale than it would have been in Peru, particularly in the early part of the last century. But she has been working closely with the Peruvian government, most recently in March, to facilitate the items' return. "Most museum-quality items would be returned," said Shailor. "We want to keep a small exhibit here because Hiram Bingham was part of the university and Machu Picchu was such an extraordinary discovery."